I told myself that I was going to take this week off. 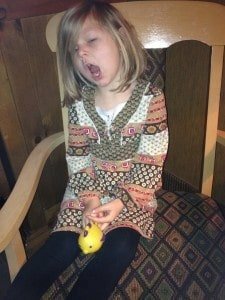 However, I thought that what happened to our daughter earlier this week was too cute not to share. On Saturday morning, we woke up at 4:30am to drive to see family in Las Vegas, about 800 miles away. On long car trips, we allow the girls to bring a couple toys to play with in the car. 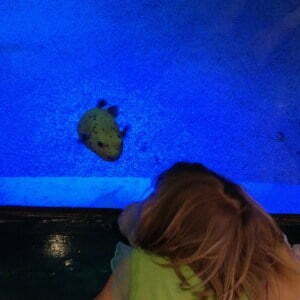 One of the toys our 4 year old (D) chose was a little yellow, rubber pufferfish. After the very, very long drive. we finally pulled into our family’s driveway. After a brief visit, we piled back into the car and made our way to the hotel. It was at this time that D realized she no longer had her pufferfish. Tired and cranky from spending the entire day in a car, it took her about .2 seconds to go ballistic. She cried and howled for her toy. We called the relatives, but they couldn’t find the pufferfish. A quick search of the car didn’t reveal it either. We gave up and went to sleep. The next morning we woke up early and went for a walk. We discovered that the hotel has a massive (117,000 gallon) salt water aquarium filled with all kinds of sea life. 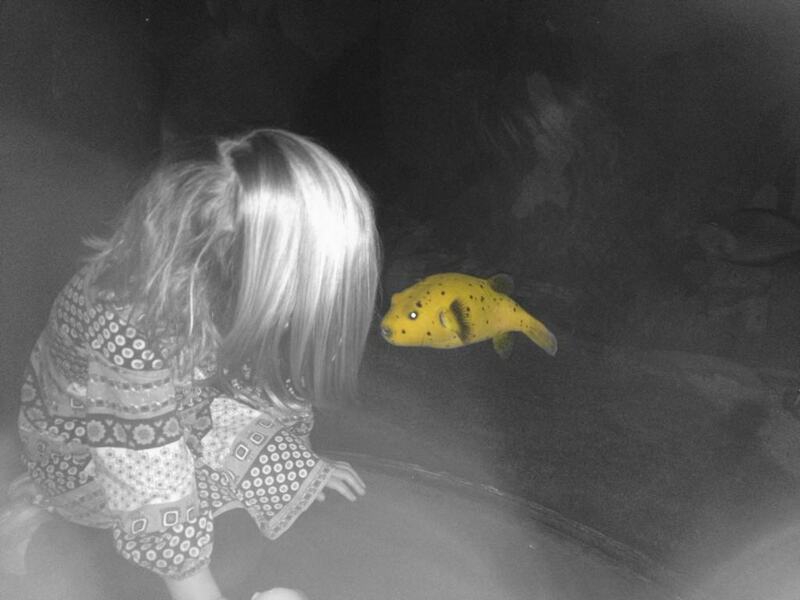 The girls walked around the tank, enthusiastically following the rays, sharks and colorful tropical fish. At some point, D spotted a little yellow pufferfish. 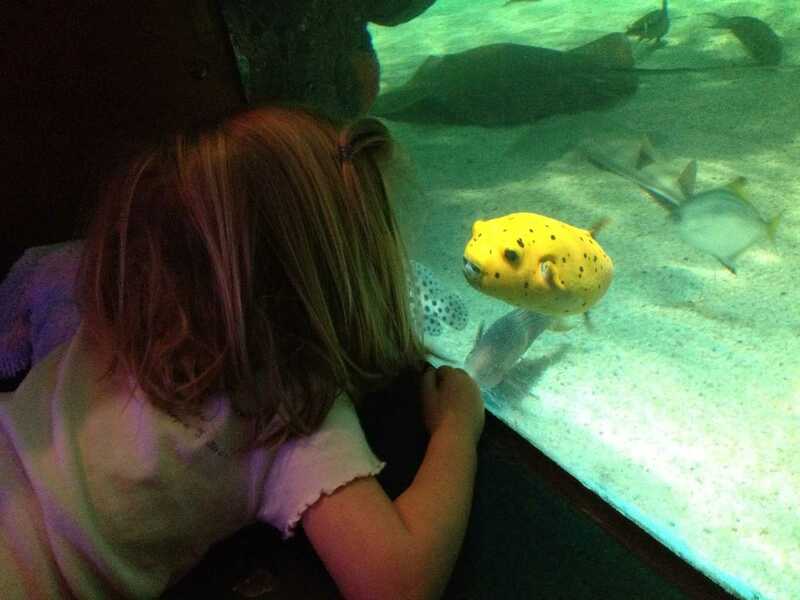 She sat down to look at it, nose to the glass and anointed the fish with the name, “Blub”. The fish took notice of her too and swam up for a better look. They stared at each other for 30 minutes. D got the idea that ‘maybe Blub wanted to come out of his tank and come with us.’ We explained that Blub had to stay in his home. The other pufferfish (since found). I suspect this one will be renamed “Blub” as well. This scene repeated itself over the course of the next couple days. D would run round the tank and find Blub. Blub would notice her and they would watch each other. D would show Blub her toys and talk to him. Blub would stare back through the glass. Finally, it was time to move on to our next destination. We said good-bye to Blub and promised D that we’d come back and visit him next time we were in town. Thank you Blub for making D’s week. Merry Fishmas to you and all of your fishy friends. I promise to visit you every time we are in town. *The Velveteen Rabbit is a book that was read to me as a child that has stuck with me. Sweet story. I’m glad you found her fish. Merry Christmas, 1500s! Merry Christmas and Happy New Year Jen! Great story! Little kids are so stinkin cute! Happy Christmas! Yes, they sure are! Well, most of the time! Cool story…kind of surreal that the fish stepped in to fill the void. Christmas miracle? I say yes. Ha, yes! Christmas Miracle indeed. There were multiple puffers in the tanks including more of the same species. However, only this one would pay her any attention. It melted my heart to watch. It’s amazing what can make kids happy and what makes them mad. It’s almost like they have a switch. Thanks for sharing. Hope sin city is fun! Ha, yes. And they can go from 0 to 60 in a second. very cute story! Merry Christmas to you and your family! Thanks Michael and Merry Christmas to you too!